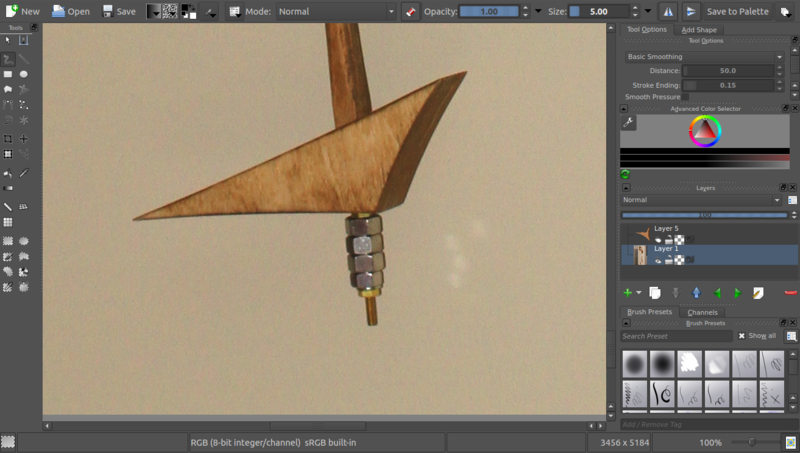 Today, I will share with you the workflow I recently used to tweak my wooden clock’s pendulum. 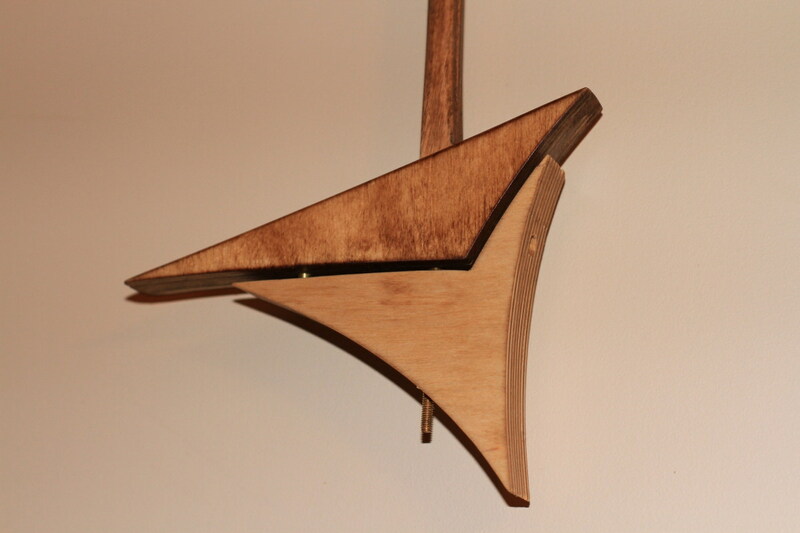 The pendulum is an important mechanical part as it determines the speed of the clock. Every oscillation is supposed to last exactly one second. If the frequency of the pendulum is too high or too low, it will result in the clock being early or late by a few minutes every hour. We can now say that to adjust the clock we need to change the bob position on the pendulum. My clock being a bit too fast, I need to move the bob a little bit lower. However, instead of changing its position, we can instead displace the centre of gravity of the bob by adding more weight below it. This is the option I chose and here’s how I made the modification. Designing an addition to the bob on this clock is actually a challenge. You need to create something nice, yet small enough not to hit the counterweight. To solve the second requirement, I decided to move the centre of gravity on the right by adding lead on the right side of the verge axis. I used the software Krita and a Wacom Intuos tablet to draw the shape of the bob extension. With Krita, I created a new layer and drew a rough sketch of the bob extension. Using the eyedropper is a quick trick for replicating the wood color. From now, you have several choices on how to proceed further. A quick solution is to export this image and use it as a background in a CAD software but you would need to account for the perspective of the shot. 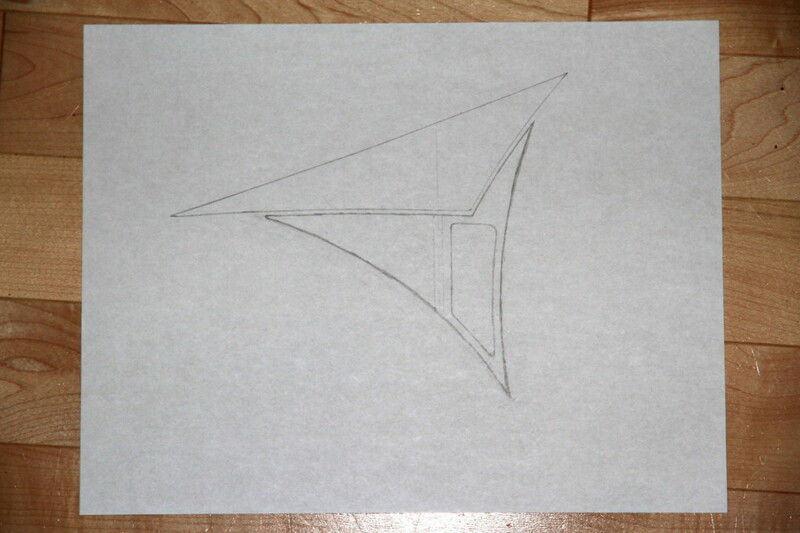 In my case, I preferred to draw and refine this shape on a piece of paper. I traced the shape of the upper bob on a letter sized sheet and drew what I thought was a more accurate version of what I had in mind. The trapezoid shape will later be filled with lead. Now that the shape of the new part has been decided, we can use this template to create the real physical part out of wood. I do have two choices to create it: using hand tools or using the CNC. 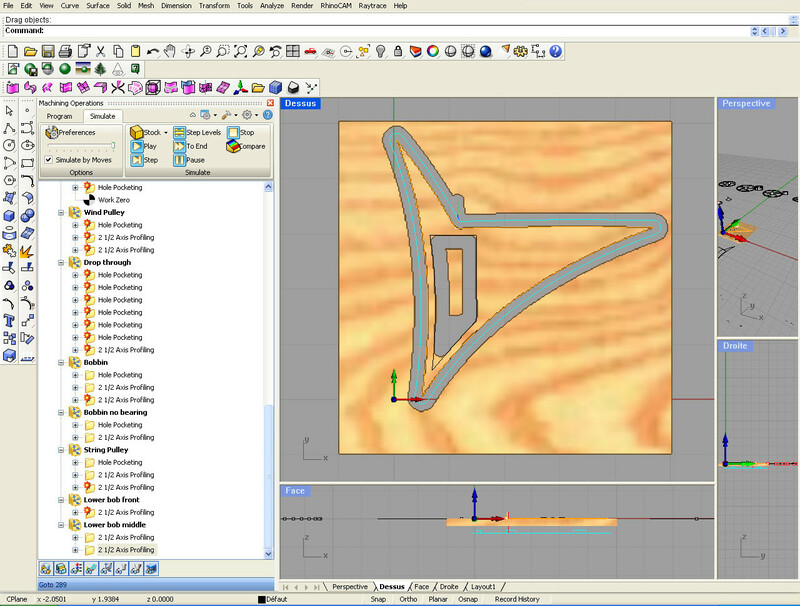 I prefer the CNC because I want to replicate the shape accurately on 3 sheets of plywood (front, middle and back). The first step is to make a digital model of our drawing. To do that, I opened Rhino and loaded my photo as a background. Then, I simply traced curves and lines and joined them together to create an object. The object was then scaled down to its final size. The front and back of the bob consist of a single cut while the middle part needs an extrusion to include the lead. Once the part has been calculated and simulated, if the results are satisfactory, we can generate the G-Code necessary to cut the plywood on the CNC. You can note that I flipped the part on the X axis because I wanted to save on plywood (I reused a 1/2″ sheet with shapes already cut out). We used Rhino to generate some G-Code. We can now run this code in Mach3. I won’t explain here how to use Mach3 as there are great resources covering it already on the web. 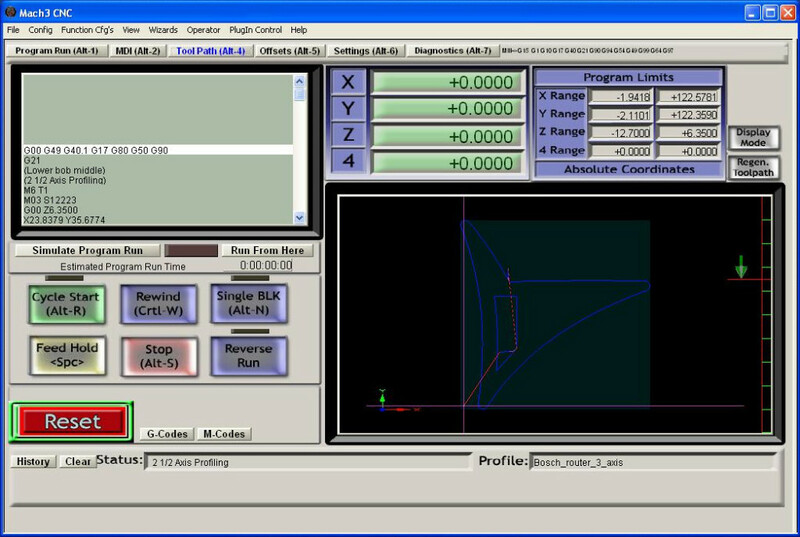 Basically, I just move the router to coordinates 0,0,0 (location indicated by the coloured arrows on the Rhino screenshot), put a 1/4″ double flute carbide router bit and run the G-code. After cutting the plywood with the CNC, you should have 3 pieces of the same size. We now need to glue the black of the bob extension to the middle part, fill the cavity with lead and glue the front part. Once the glue has dried, you we can sand the edges and apply a finishing coat. I used danish oil to stain the wood to a light walnut colour. To attach the lower bob to the upper bob, I made 3 holes on the side of my new part: 2 counter-holes for brass wood screws and 1 for the verge length-adjust screw. While this is definitely not the only method to create parts from plywood, I believe that using this workflow was a good way to transcribe my ideas into a physical object. Digital drawing is fairly new to me but I was quite satisfied by the results I got. This helped me select the most convenient design relatively to the existing parts.